Dunrovin Ranch’s location along the Bitterroot River, with its riparian cottonwood forest, makes it a magnet for birds of all kinds. The ospreys, of course, demand top billing with the enormous nest that is a centerpiece of the ranch and their boisterous family life is a hallmark of Dunrovin’s summers. But they are not the only birds that call Dunrovin home or pay a visit. Sparrows make their own nests in the lower catacombs of the osprey nest. Other raptors including bald eagles and Cooper’s hawks use the nest as a vantage point when searching for prey. Even woodpeckers, flickers, and magpies stop by. Dunrovin also maintains several wild bird cafeterias that attract everything from goldfinches to wood ducks with stunning colors. The river is home to kingfishers, great blue herons, and many ducks and geese. Golden eagles and red-tailed hawks soar overhead. The fields attract meadowlarks, bluebirds, and flocks of snow geese during their annual migration. Waxwings swarm berry-laden bushes and wild turkeys and grouse strut across the lawns. Many of these birds can be easily seen via our web cameras. For the past several years, within weeks of the ospreys departing their nest, Dunrovin has hired a bucket truck to take us up to the top of the 47-foot-high pole to install several bird feeders onto the perch that rises above the nest. We also install several bird feeders on a pole that is beneath the osprey nest pole, near a pine tree along the side of our barn, and well within good viewing range of our nest web camera. Resident birds of the area have become accustomed to these feeders, relying on them for food during cold winters. Some visitors are regulars. Sparrows and starlings can be found at the nest all year long, using the catacombs in the “basement” of the ospreys’ nest for their own nests. It’s an ideal situation. The ospreys keep away the other birds of prey and bring fresh duff for nesting materials, which the little birds immediately steal for their own nests. We have found great joy in watching these very common, ordinary birds that some disparage. Intimate, close-up details of nearly any bird magnify their beauty and allow us to see what we can so easily pass over. We also have the pleasure of watching them in all weather, at all stages, from juveniles to adults. These ever-present nest dwellers are responsible for much of the cacophony emanating from the nest microphone, which reaches a loud crescendo during the spring. Finches are ubiquitous at the feeders. Goldfinches and house finches dominate, while the occasional purple finch has also been spotted. Appearing daily on the web cameras, the gradual color changes that the male finches undertake during the breeding season stand out. Their drab yellowish feathers turn to pure gold by late spring in their efforts to find a mate. Many other birds occasionally stop by – some common to this part of Montana and others quite rare. It is a great treat when they stay still long enough for close-ups. The most ordinary of birds like the lonely pigeon have such beautiful feathers when you can see them shinning in the sun through our web cameras. Several species of woodpeckers frequent the suet feeders. They range in size from the small downy woodpecker to the large pileated woodpeckers who announce their arrival with their distinctive calls. Pileated woodpeckers mate for life and stay within their territory together. It is not uncommon to see the male (with its red cheek stripe) and the female (lacking the red cheek stripe) arrive together to feed at the same suet cages. Magpies seem happy to share the feeders and perch with other birds, flitting in and out in small groups. Another common visitor is the black-billed magpie. Magpies, like their cousins – crows and jays – are social, gregarious, and very vocal. Their quarrels can be heard as they gather to feed off the suet and pick the fruit from the Dunrovin trees. Their black, white, and iridescent green feathers shine in the sunlight. All of the bird activity at the feeders does not, of course, go unnoticed by the resident birds of prey. 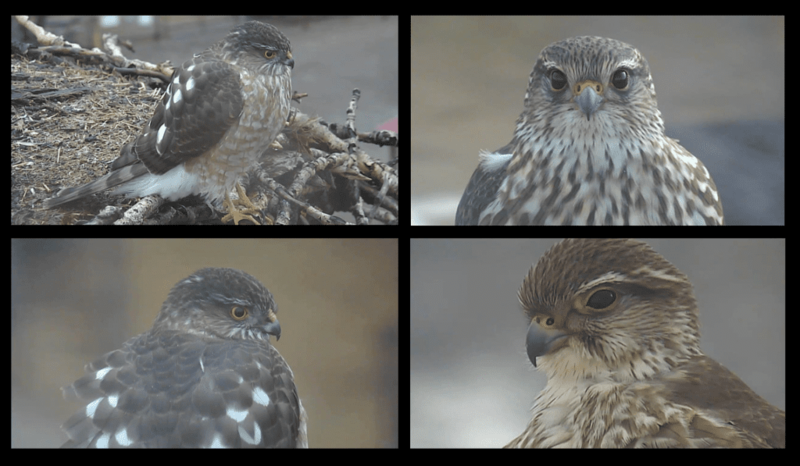 Announced with silence, hawks and falcons are regular visitors to the nest. As soon as the ambient noise at the nest goes silent, you can bet that a hawk or falcon has arrived to lay in wait for a meal. Some of them stay for long periods of time, giving us the opportunity to caress them with our cameras and get lovely close-ups of their feet, feathers, and eyes. Occasionally, North America’s smallest, and arguably most beautiful, falcon visits. The male American kestrel boasts feathers of blue and orange with brown and black spots. Feeding on a wide variety of prey, from moths to small mammals, they do not generally eat bark, yet that is exactly what we caught one male kestrel doing. Was he seeking the medicinal qualities of cottonwood bark that contains a resin which relieves pain in muscles and arthritic joints? Perhaps our most unexpected guest to the osprey nest caught on camera was the female great horned owl that seemed to think that she would make the nest her own. For several nights, our night owl D@D members on the east coast would report seeing an owl. I suggested that they text me the next time they saw her so we could get some decent photos. With the nest infrared light, the depth-of-field is very narrow and often the birds are out of focus. Well, they took me at my word, woke me up, and I was able to get some nice photos and a video of her attempting to set up housekeeping. Mrs. Owl continued to haunt the osprey nest right up until Harriet Osprey returned. In fact, we caught Mrs. Owl knocking Harriet completely off of her perch. The video is not in focus, but the action is clear. Everyone who saw it was worried that Harriet had been killed and we were much relieved when they saw her back at the nest a little later. Several of our DaysAtDunrovin members had been keeping a list of all the birds they have seen via our web cameras, be they at the feeders, in the fields, or just doing a fly-by. Ospreys, of course, head the list! In thinking about all of the birds that have made an appearance at Dunrovin, I would be negligent to not mention our most unusual bird. 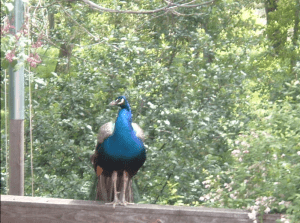 In the late summer of 2004, we had a peacock visit our backyard feeder. Clearly, he had escaped from someone’s care, and we were unable to capture and rescue him. After seeing it at the bird feeder, I noticed our horses running wild in our south pasture, and there was the lone male peacock fully displaying his feathers. The horses were very impressed!